10 Years After The Rising, 'Iron Gold' Asks: What Now? Pierce Brown's rip-roaring Romans-in-space series Red Rising seemed to come to a triumphant end with last year's Morning Star. But what was the cost of that triumph, and where will it lead? 10 Years After The Rising, 'Iron Gold' Asks: What Now? It has been 10 years of war. In Pierce Brown's Red Rising universe, the rebellion begun by slaves three books ago, then carried into the stars by slaves become heroes, become gods, become myths, has nearly been won. Mars and Earth and Luna have been freed from the imperial control of the Gold ruling caste. The green fields of Mercury (just ... go with it) have been won at the cost of a million lives. Venus is all that remains now — stronghold of the Ash Lord, last vestige of the old order. Just one final epic battle, right? Then victory, sweet and eternal. No. No way. If you're already a fan of Brown's books (and you should be), you're already accustomed to the complex, layered, incredibly human-scale stories he's been telling for the past few years. Tales of war and honor and betrayal and regret grafted (somehow, nearly impossibly) onto an almost childishly simple frame of space Romans waging pew-pew laser gun fights over who gets to be Grand Poobah of the solar system or whatever. And look, if you're not a fan — if you're coming cold to this strange place — then I can't even begin to explain to you the epic that Brown has already crafted. There are a hundred characters, all with goofy names like Victra, Cassius or The Jackal, and a hundred battles, all reading like your most fevered science fiction daydreams come true on the page. But at the core of it, there's Darrow, originally a 16-year-old slave on Mars, who made himself the leader of a revolution that grew into a rebellion that ignited the entire solar system. Darrow became the Reaper — a leader, a legend, the deadliest thing on two legs. And the men and women who fought with him became like angry child-gods let loose upon the world, all of them bloodstained and looking for vengeance upon those who had once been kings and queens. And if it sounds like I'm being sly here, or mocking, I am absolutely not. I have loved with a nerd's glee every one of these books — and loved them even more for their absolute, over-the-top ridiculousness, their soap opera plots and Brown's unapologetic love for cranking everything to 11, all the time, forever. Even his quiet moments are QUIET. Even his peaceful ones probably have a snake hidden somewhere. But his newest, Iron Gold, is something else. It is his crux book — the point at which his series (already nearly 2,000 pages long) has to do something new (sound familiar, sci-fi fans?). Because we've had Darrow's youth. We've had his rise to power and his wars. The last book, Morning Star, was Darrow at his peak, smashing the forces of his enemies, becoming not just a hero, but a legend. And while a lesser author would've just kept things rolling, running his Good Guy straight into battle and victory, Brown ain't no lesser author. Instead, he did something unusual. He made his new book about someone else. He made it about a young girl in a refugee camp, saved from a life of slavery and then abandoned by the rebellion that freed her and her family. He made it about an old soldier, traumatized and tired of Darrow's war. A man who gave up the fighting and turned criminal, running from his past and all its supposed glories. He made it about a prince in exile — one of the enemy, spirited away and in hiding. And he made it about Darrow, too, of course. And his best friend Sevro. And the Howlers and Mustang and Dancer and all the old names that everyone expects, of course, but mostly (and best ... ly?) it is about these other people who are in the bad places they're in because of Darrow and the rest and their war. 'Iron Gold' is mature science fiction existing within the frame of blazing space opera. 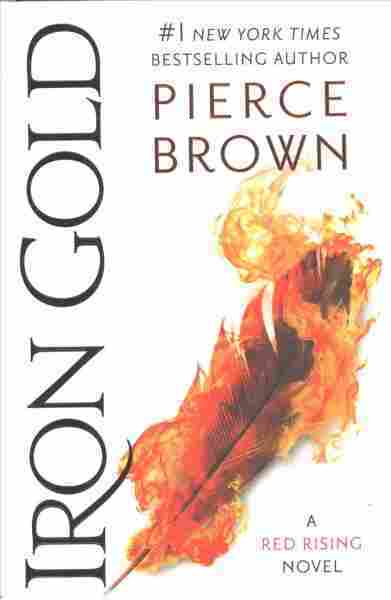 Iron Gold is mature science fiction existing within the frame of blazing space opera, bouncing back and forth between some of the most cinematically brilliant nonsense you'll ever read and serious discussions of politics, morality and the cost of violence. It is, all of it, done in a style so purple that it borders on Shakespearean, and offers us both a continuation of the story Brown has been telling for years right alongside an eye-opening widening of his universe, as though we're watching it all through an exquisitely calibrated telescope that can slide on perfect bearings from one side of the solar system to the other without the slightest blur. The old hero is still there — the Reaper grown and exhausted, haunted by all the killing and dying that has been done in his name. Once a man willing to risk anything because he had nothing to lose, now he has a wife, a child, friends, a home, power. And in this state, he is forced to face an uncomfortable question: Would he know peace if he saw it? And what would he do, this god of war, if peace was actually offered to him? But in most important ways, Brown has chosen to hand his narrative over to those otherwise forgotten by most war stories: the homeless, the outcast, the broken. He allows us — forces us, really — to see our heroes unadored and the world the Reaper has made through eyes other than those who forged it. He asks, through them, So ... was it worth it? Jason Sheehan knows stuff about food, video games, books and Starblazers. He is currently the restaurant critic at Philadelphia magazine, but when no one is looking, he spends his time writing books about giant robots and ray guns. Tales From the Radiation Age is his latest book.